Je croise les doigts pour une diffusion sur Canal+. 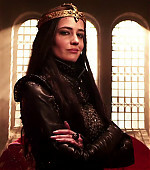 I hope we in Australia get to see Ms Green in Camelot. Shame that such a brilliant actress doesn’t get the recognition that she should!! I am very angry! I know what you mean but despite her great beauty and talent i find her resume to be very honest because it shows someone more passionate than careerist. I love her so much. I have mixed feelings about this teaser. On one hand, its very well done. On the other, it’s very, *very* reminiscent of the more recent Game of Thrones trailers. I really think Starz would do well to avoid comparisons to GoT. GoT is going to be, from what I can tell, excellent. Its stars are all very solid (more so than, say, Campbell Bower or even Joseph Fiennes). It benefits from great production values (admittedly, so does Camelot), and its writers are working off of an excellent, and more or less pre-determined plot. (Its based on a book series.) It’s tough to screw that up. The approach to writing and developing Camelot appears to be much more traditional, which isn’t a bad thing – the show can still be very good – but quality and consistency of quality will be far less certain. I’m afraid that if Camelot attempts to compete with GoT, its every flaw, however small, will stand out. Starz has hired some big names, but most of them are up-and-comers – that is, inexperienced. Its thrown a lot of money into costumes and lensing…but that doesn’t equal quality either. I know Chibnall has been emphasizing quality, but going by my limited exposure to his previous work, he isn’t exactly on the level of the writers of Rome. I’m hoping he surprises me, but my optimism is cautious. I hope the show succeeds for Eva’s sake, but trailers like this one, which seems to be pitting the show directly against GoT are worrying. It makes me wonder if the producers of Starz are just a little too focused on pitting Camelot against GoT. @Nausicaa Judging from Spartacus I hope that Camelot will move in a different direction. My opinion for Spartacus is not very flattering. I hope that Starz people understand that Camelot is a different style of project. Any link for the 2nd trailer for not US? Where I can see the second tease trailer? If I could give you a little advice, choose SD because the video is a little slow-moving in HD. @ Nausicaa: Like you I feel slight apprehension about Camelot as well. And I agree about your assesment on Eva’s co-stars. Eva is beautiful! The direction of Camelot has chosen her protagonist well. I am Brazilian (probably the only Brazilian fan of it!). I liked her performance in Kingdom of Heaven and Casino Royale, I hope they get over Camelot and which premiered in Brazil. @Yasmim It’s not actually a trailer the 2nd teaser. It just shows Fiennes, Bower and Eva in their main roles and lasts only 30 seconds. Ku Kla – Bella !!! Thank You as always Mariana you are very much Appreciated!!! !